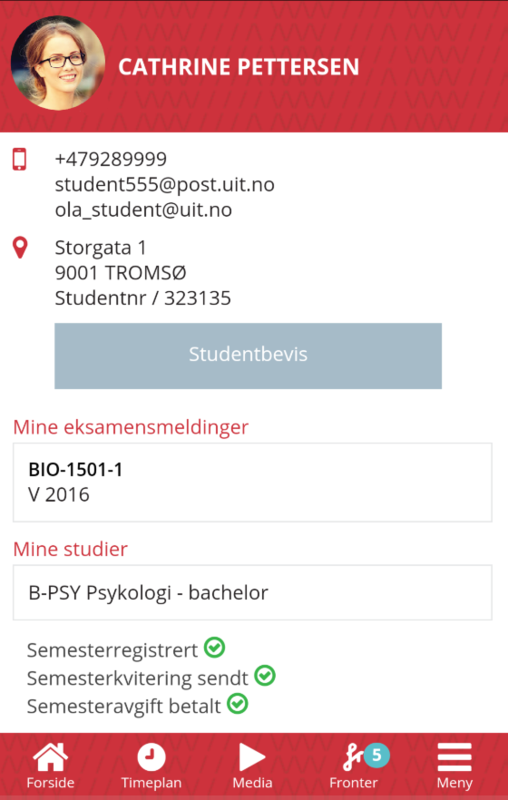 Student app for all students attending UiT The Arctic University of Norway. Boasts functionality like class schedules, information about you and your classes, lecture recordings (only available for study-programs that publish lecture-recordings), the latest news from Fronter, and student e-mail. To be able to use the app you must have an UiT username and password. 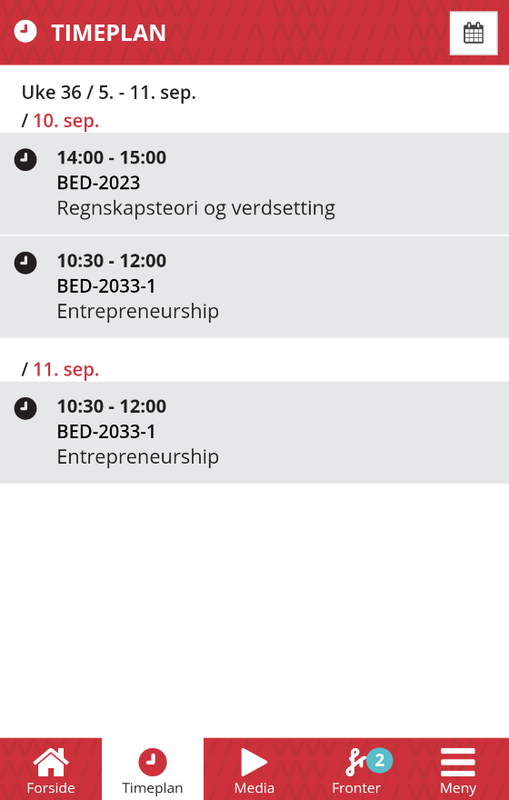 You can also search on your own using the search term "uit student". Use your UiT Username and password. The app will remember this information for an extended period of time before asking for a re-entry. 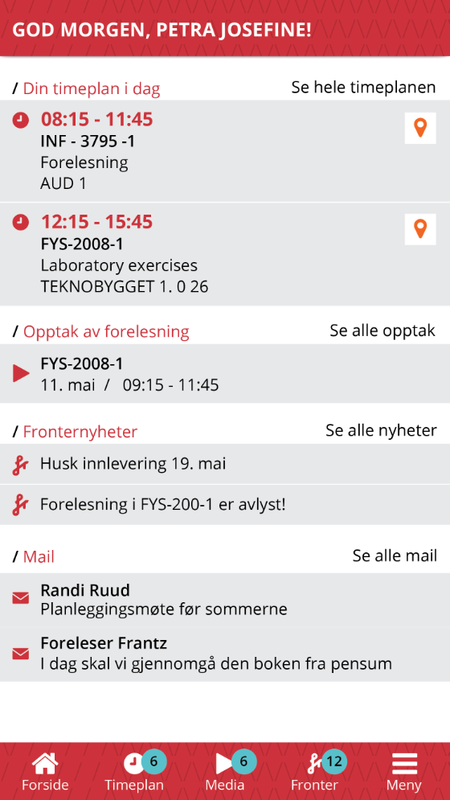 The app's Frontpage gathers and displays your most recent class-schedule events and info. Click the location-icon to access MazeMap. 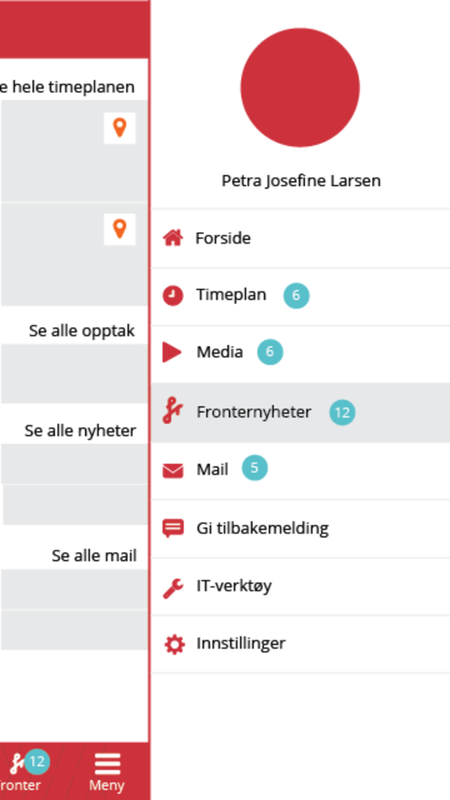 Change the app language from norwegian to english by accessing the Menu (see photo above) > Innstillinger > Språk > press the "norsk"-button, and select English from the pop-up menu. Your student-info is found by pressing your name or photo whilst in the Menu (see photo above). Your profile picture is the same picture that's used in the Studentbevis-app. The button labeled "Studentbevis/Student ID" is merely a quick-link to a separate app (which you have to install to be able to use). Make sure that your contact information, e-mail, phonenumber, adress og studentnumber is correct. If not, check it out in Studentweb before reporting an error to the Oracle. My registered exams shows which exams you have registered for in the current semester. If nothing is showing, you should visit Studentweb and, if applicable, sign up for exams. My classes and the fields about semesterregistration and payment are also dependent on whether or not you actually have paid your fee and enrolled in classes and exams. Remember, there might be a delay in these systems, so that which is registered one day might not turn up before the following day in the app. If you are having any doubts concerning these matters, please review the checklist for new students. Press a schedule-event in the listing to view its details. The embedded MazeMap-button is located just below the text, and transports you to the MazeMap-app - if you have it installed. MazeMap will show you the path to the locale in which the lecture will take place by utilizing your device's GPS-function (must be turned on). If by chance MazeMap fails to locate the desired destination, you will see a message indicating this. If you are in need of locating the office of a faculty staff member, we recommend searching for the person or office with the Search-field found on the frontpage of the uit.no webpage. Please use correct spelling. 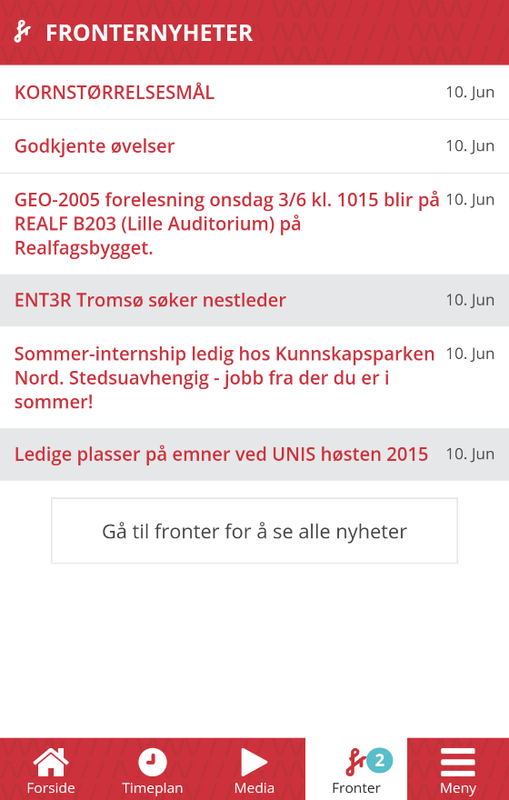 The app-page Fronter allows you to view all the lates Fronternews associated with your study-programs. If you are having doubts as to whether or not you actually have seen every bit of information from your Fronter-rooms, we always recommend that you visit Fronter in full-version by it's webpages regularely. Clicking the button at the bottom will redirect you to the Fronter webpage (and demand that you insert username and password, at least the first time you visit). Notice that the new Fronter-webpage is opened in your phone webbrowser, meaning that by now you have switched apps. To get back to the UiT Student app, you could tap your Start-button and relocate the app icon, and tap it to re-enter the app itself. Under Menu you can tap E-mail to view the 20 latest e-mails sent to your UiT e-mail account. Sadly, you cannot yet read and answer mail directly from the app itself (due to security measures). When you tap an e-mail from the listing, or the button labeled "View all my e-mails", you will be redirected to the OWA (Outlook Web App) associated with your UiT e-mail account, located at mail.uit.no, and you can read and answer e-mails there in your web-browser - after having logged at least one time with your username and password. Let your device remember your log-in credentials for easier access the next time around. 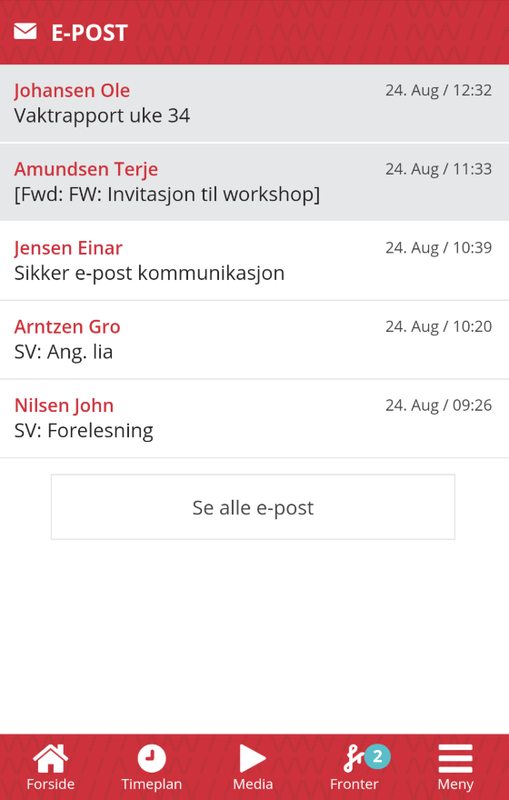 In-app e-mail is ment to be an extra service letting you know that you have indeed recieved e-mails from UiT. For many intermediate users, the option to synchronise the UiT e-mail account directly to your phones native e-mail client would also be a good choice. Take notice that the e-mails opened in the OWA e-mail client, is in fact doing that in your phone's native web-browser, meaning that by now you have switched apps. To get back to the UiT Student app, you could tap your Start-button and relocate the app icon, and tap it to re-enter the app itself. If the app freezes, stops or otherwise behaves in an irratic manner, please wait to see if the behaviour stops on its own. If not, close the app by removing it from the device's task manager. Then start it anew. If you are experiencing other issues or errors, we always recommend that you report the errors directly. Navigate to Menu > Give feedback > tap "Write your feedback" and write us an e-mail containing a precise account of your troubles. The e-mail should auto-direct to our helpdesk, Orakelet (the Oracle) at orakelet@uit.no. We will handle your inquiry from there. Finding errors, even though you have the latest version of the app installed?